If you're one of the many that have a limited data usage it can be a struggle to keep track of it, an those hefty bills once you've gone over that limit can really make your heart sink. One of the biggest questions people ask is, what is happening to my data usage? Why is so much being use? 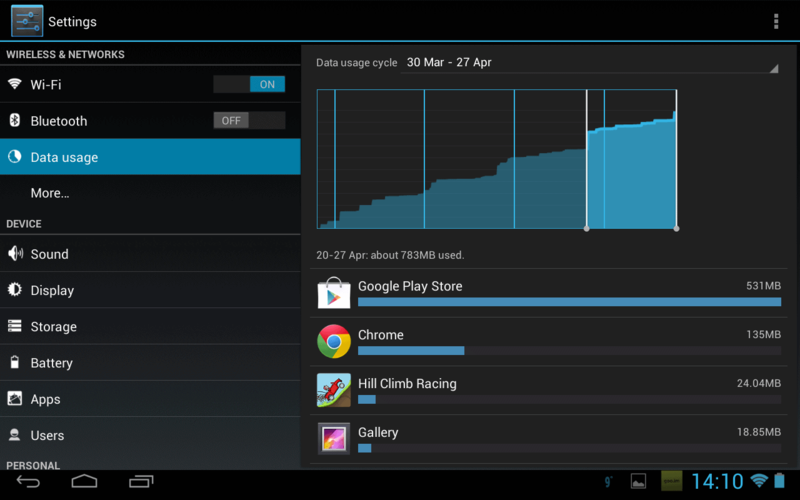 Well here is a few tips and tricks you can use to reduce your data usage. Pretty much every smartphone or tablet, especially the ones that have cellular data capabilities also have a WiFi antenna, and also all people who own a smartphone or tablet have WiFi at home. If this is the case, make sure you take full advantage of your home WiFi by linking up your device with your router. There are a vast array of Data Monitoring apps available to both iOS and Android Users. While these range from apps that just monitor your usage based on a billing cycle you input, others can intuitively warn you about your usage, and aid you into rectifying the problems. Android users can access apps such as "My Data Manager" [pictured below] which can manage every app and service that users data on your phone. This can also help you find out what is using a lot of data, and whether you really need that app. Push content can be a major part of someones data usage, especially those use social networking sites and/or use their devices for emails, this could be your cause! Push is a service that allows apps and services to push content to your device. For example, if you have an email account linked to your device and have push enabled, whenever an email is sent to that account, your device will pick that up and will automatically download that email to your device. The same applies have social networking sites such as Facebook or Twitter. Although these sorts of services don't consume huge amounts of data, if you have a lot of emails/notifications it can soon add up. Keep a close eye on what and how your streaming, this can be one hell of a data muncher! Streaming one hour of HD, not even a full movies worth, can easily get through 2GB of data, which is more than a months worth for the average contract. Standard definition is alot better than streaming HD, but can still get through alot of data if you don't take care of what you are streaming. Many new services have appeared lately and are causing a digital shift in how we listen and interact with our music. Apps such as Spotify, Rdio and Pandora all offer services to stream content to your device. Although this is much better than streaming video content, it again is a big data consumer and should be watched with a close eye ! This may sound obvious to some, but alot of devices are now 4G capable, and alot of mobile providers now offer 4G connectivity, however faster speeds mean much higher consumption. Just switch the LTE setting off and you could see a huge savings in your data usage. Whilst this may not apply to all, it can make a huge difference to those with a 4G/LTE package.